"Any customer can have a car painted any color... so long as it is black." We've come a long way since 1909, when Henry Ford penned this now-famous sentence. Not only can modern consumers pick the colors and features they want in a vehicle, but, in many cases, they can order them online. Getting the car you want, with the options you want, has never been easier. Still, most forms of personalization are baked in. Once you order a car in, say, Barcelona Red (the color of my new Venza), it's hard to reverse the decision. But imagine the day when you can sit behind the wheel and watch your car's instrument cluster automatically reconfigure itself according to your personal preferences. And imagine if the cluster could do the same for everyone else who uses the car. 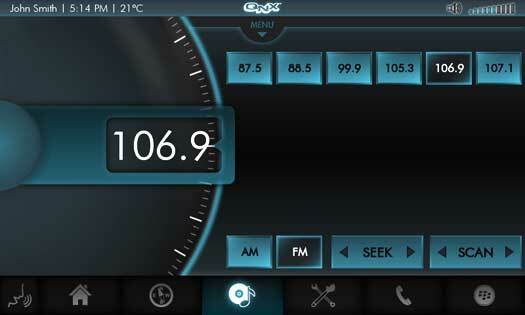 That's the kind of future QNX is working to make happen. By the way, if you were one of the first 25 people in Canada or the US to guess it was a Jeep during our recent teaser campaign, congratulations! We'll identify the winners shortly. As you can see, the cluster communicates with the head unit's navigation system to display turn-by-turn directions. Nice touch. Now look to your right, and you'll see the head unit. It supports a whack of functions (note my deft use of technical language), including one-touch pairing with Bluetooth smartphones, hybrid navigation, text-to-speech, natural speech recognition, streaming Internet radio, weather reporting, parking search, and too many other things to mention here. In this photo, the head unit displays one of my favorite applications, the virtual mechanic. Intrigued? Check out my description of an early version of this app. You know what else is cool? The unit's media player can post Facebook updates that list the song currently playing — but only when you tell it to, using voice commands. (Personal control over technology. I like that.) To view these updates later today and tomorrow while the Jeep is at Telematics Detroit, check out the QNX Facebook page. 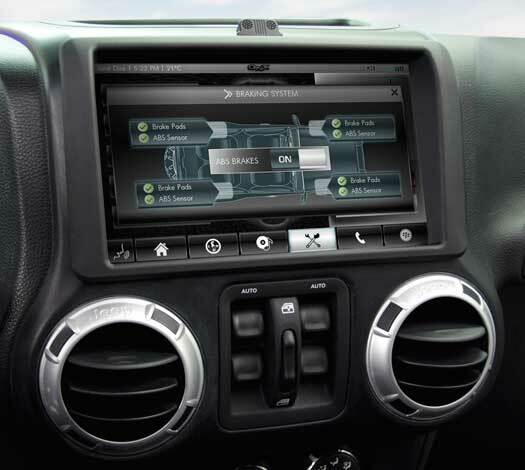 In fact, almost every aspect of the head unit can be easily re-skinned. What's more, the underlying code remains the same: only the user interface, created in HTML5, changes from one skin to another. Which means automotive developers can create a single code base and re-use it across multiple vehicle lines. Doing more with less — what could be bad? 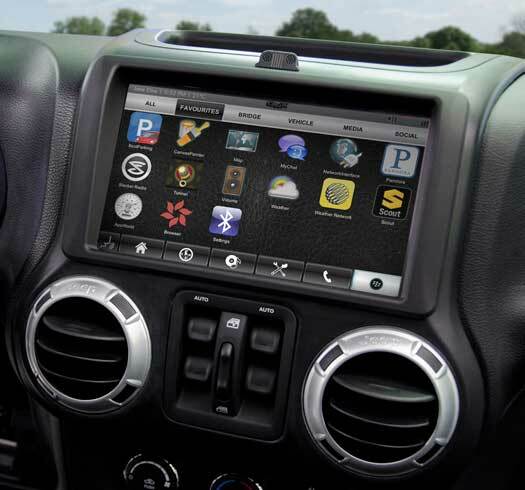 That's all I have for now, but before you go, check out the two press releases QNX issued this morning on the Jeep's personalization and Facebook features. 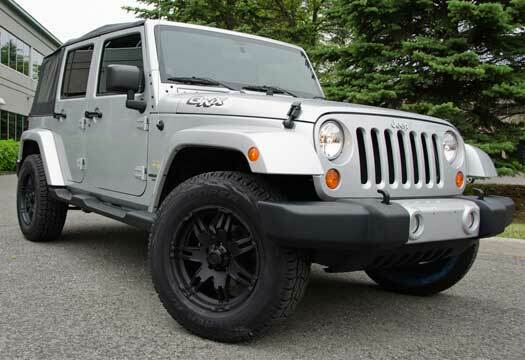 Also, check out the QNX Flickr page for even more photos of the Jeep. If this was put into a Jeep Grand Cherokee SRT8 I would buy it in a heart beat! So stylish advanced technical meters.These gadgets are projecting this jeep in a very stylish manner. Facebook in my car? I don't need that crap. So when I can send you my car so you can do this to mine?! 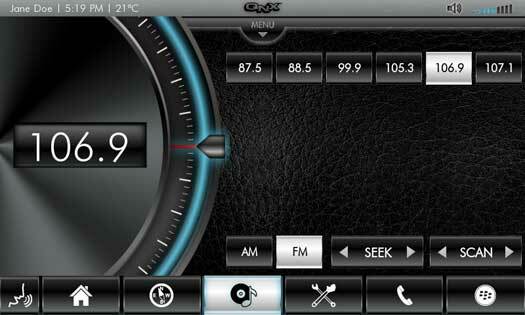 I would love to have this system in my car! You know, with Apple's new iOS6 announcements, I really really hope you guys are planning on using the already integrated QNX platforms to provide some real bells and whistles with the BB 10 phones. Bells on? I want you rolling them in and causing tinnitus in iOS and Android fans for weeks. BTW, is the Tachometer also a Roll and Pitch gauge (Inclinometer)? I guess it probably isn't, since that would require the sensor. But, that would always be a nice feature to have on the dash when off-roading. I don't do that now, but when I had my Liberty, it sure would have been nice to know how much further I had to go before rolling it. Good question. (Which means I'm not completely sure of the answer :-) I'll check, but I think that, for now at least, it's just a tach. But yeah, it would be a cool feature for off-roading. Stay in touch, keep connected, check for parking, see the weather, get distracted, crash into the car ahead of you, run over that pedestrian, go through the red light, sue the manufacturer for providing a distraction tool that caused the accident. Sometimes, too much is too much. Anonymous, you won’t get any argument from me that distraction is an issue that must always be considered. I will, for example, turn my car radio off if I find that I’m listening to the music more than paying attention to the road. That said, consider the “check for parking” example. I don’t know about you, but I find it very easy to get distracted when looking for a parking space in an unfamiliar part of town. Maintaining situational awareness is tricky when your mind is focused on looking for a big capital letter P. But what if you could say to your car, “Find me a parking space.” And what, if in a couple of seconds, your car said “Turn right at the next light, then drive 100 meters,” or something similar. Suddenly, your brain would be able to focus much more on the car ahead of you, on the pedestrian about the cross the street, on the light that’s about to turn red — or so I believe. What I’m trying to say is that connected cars just might be able to reduce distraction in many scenarios. Done correctly, they could you help stay better connected to the road, not just to your social-media friends. Anonymous, I think the key point here is "personalization" which means you will have as much or as little as you wish. And yes, I believe the intention is to integrate your handheld device with the car's intelligence so that it *knows* you and has an awareness of all your preferences.